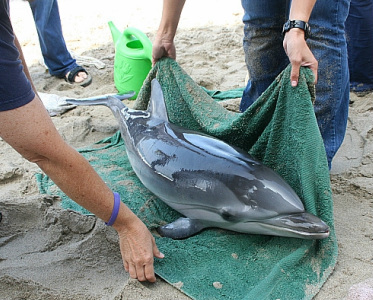 A stranded baby dolphin is helped back into the sea in California. 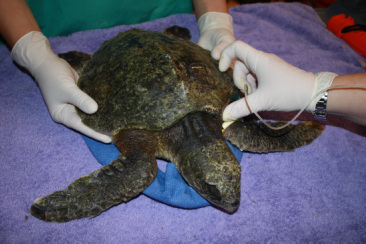 An oiled Sea Turtle being cleaned up after the oil spill in the Gulf of Mexico, 2010. 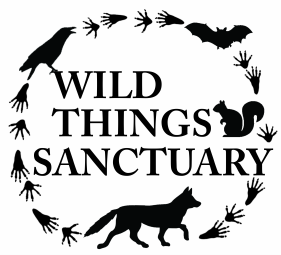 ​Wild Things is nestled in the Finger Lakes region of NY and sees its fair share of aquatic birds. However, it is a long way away from a coast and does not work directly with marine mammals. If you need help with a marine mammal who might be in trouble please locate a local wildlife rehabilitator using the online rehabilitator directories. You may also want to contact the local Coast Guard or State Marine Patrol. Even if the animal has already died, it is often important to determine the cause of death to prevent more animals from getting into fatal trouble. This is a short hand-out and I will post another if I find a better one!